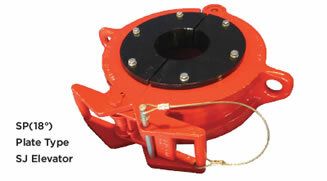 Den-Con Tool Co. offers a wide range of manual elevators for handling tubing, drill pipe, drill collar and casing. Safety locks and latches are included in the design features of the Den-Con Elevator. All elevators are pull-tested prior to shipment to insure that the elevators meet or exceed industry standards. TYPE P/N R.C. TONS (MT) SIZE O.D. 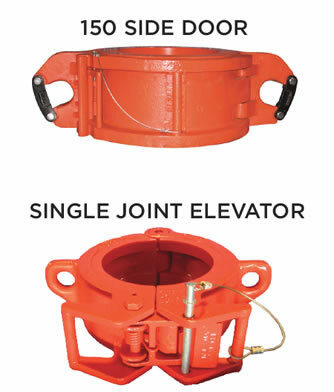 The Den-Con Plate Type Single Joint Elevators are designed for use with bottleneck pipe connections. Plates are easily removed and replaced as pipe sizes change. 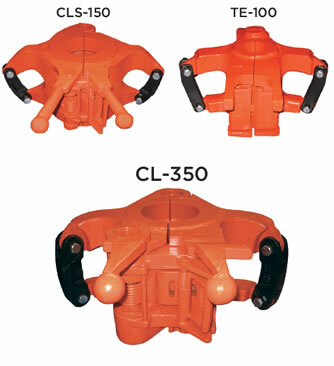 Rated capacity is 5 tons and pipe size range is 6 5/8” - 2 3/8”. Assembly and guide part numbers are detailed in the table below. The Den-Con design minimizes the small parts that are used in bottleneck single joints of other makers. Den-Con CL bottleneck elevators are available with wear guides. 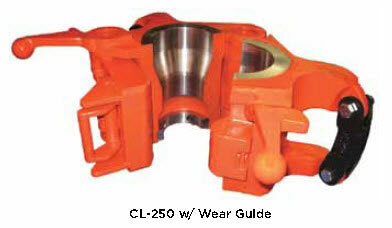 Wear guides are available for 350 Ton, 250 Ton and 150 Ton Elevators and for pipe sizes detailed in the table below. The guides are designed to be an expendable wear surface that prevents the pipe from wearing the elevator bore during rotation.